Here at Time Doctor, we’ve become obsessed with outsourcing. It’s how we’ve managed to grow our business from a two person, intercontinental company, to a fast growing startup of 50 people. The way in which online outsourcing has become so ubiquitous has been a key driver in our growth, and the growth of several startups. This is why we created this in-depth guide to outsourcing. But, for this article let’s look at outsourcing trends in 2019 and see just how the industry is fairing. How Big is Online Outsourcing? Online outsourcing sits at the intersection of several large industries: local hiring, temporary staffing services, and traditional outsourcing. Just how large are these industries? These industries have spawned a new generation of outsourcing opportunities where employers can leverage a variety of different online technologies and services to connect directly with freelancers, virtual assistants, and knowledge based workers. Over the past few years, the amount of money spent in online outsourcing has grown significantly. By analyzing the revenue growth of three popular online talent marketplaces, it’s evident that businesses are increasingly spending resources on these platforms for both full time staffing and temporary staffing solutions. Over the past three years, the platforms Upwork, Freelancer, and 99Designs have shown significant revenue growth. The industry is dominated by Upwork, which has grown 77% from 2012 to 2014. In that same time frame, Freelancer has grown by 92% and 99Designs has grown by 354%. In 2015, Upwork estimates that will spend more than $1 Billion on its platform to find freelancers and knowledge based workers. And by 2018, the company estimates that online outsourcing will be a $5 Billion dollar industry. Online marketplaces and platforms compete with traditional staffing. Staffing services is a huge industry at over $416 Billion dollars. However, the vast majority of these workers are working in offices in specific industries such as IT. Upwork executives have stated that the reason they combined the companies Elance and oDesk to form Upwork is so that they could bring the benefits of online outsourcing to businesses and compete with the traditional staffing companies. Workplace flexibility is when employers grant their employees ability to spend at least part of their work week away from the office. This allows employees to choose when and how they work. Further research on Hok.com indicates that thirty percent of employees with flexible work arrangements report feeling very engaged in their jobs compared to 10 percent of workers who feel engaged with no workplace flexibility. Because many of the connections made by employers and knowledge based workers do not take into account geographical locations, workplace flexibility is built into the hiring system. The result is more and more talented knowledge based workers are joining online marketplaces in order to find employment. Not every software company is going to be created in the shadow of Stanford University where Silicon Valley plays host to a high concentration of software engineers. If you’re the CEO of a software company, there is no need to move to San Francisco or Boston to gain access to highly talented software engineers. Online marketplaces give businesses of all sizes access to global talent pool. No longer are entrepreneurs confined to hiring the best talent in their geographical region. They can hire the best talent they can afford at a global scale. As hiring trends move toward workplace flexibility and accessing global talent, businesses of all sizes are using these drivers to reduce their real estate costs. Insurance giant Aetna is another company that uses flexible workspaces to boost its bottom line. Of Aetna’s 35,000 employees, 14,500 do not have a desk at Aetna, a move that the company’s top executives, CEO Mark Bertolini and national business chief Joseph Zubretsky, have said goes a long way to cut real estate costs. Another 2,000 Aetna employees work from home a few days a week, meaning that a total of 47 percent of the company’s work force uses flexible workspaces. Small businesses can also see the effects of hiring remote employees. According to research done by PGi, the average business with full-time telecommuters saves $10,000 per employee per year in real estate costs. Because online marketplaces foster workplace flexibility, remote work, and telecommuting, businesses are increasing the amount of resources spent in these marketplaces in order to reap benefits such as saving money in real estate costs. As both operators of an online outsourcing marketplace and proponents leveraging them to find offshore workers to help grow our business, we wanted to include some of our own first hand information. One of our favorite countries to hire offshore workers is the Philippines. Filipino workers are both affordable for small businesses and startups like ours and speak great English. These are two factors we value greatly when hiring offshore workers. Depending on the job requirement and experience level of the offshore worker, the cost can vary. However, we find in most instances these costs are much less than hiring knowledge workers from Western countries. Let’s quickly take a look at eight popular online marketplaces and see how they’re different. What it is: Outsourcely is the world’s easiest way to find, hire and work with reliable, vetted remote workers from 132 countries that are looking to build long-term sustainable relationships (not work short-term freelance projects). How it works: Search remote workers by skill or post a remote job. Then connect with candidates immediately using real-time communication tools. Hire directly and pay zero fees. Why it’s different: There are a few major differences between Outsourcely and the other talent marketplaces. The first is the talent pool is mostly looking for long-term remote work, not short-term freelance projects. This is great for employers that are looking to build sustainable working relationships and long-term remote teams. The second is Outsourcely allows employers to hire directly and pay their hires directly. Meaning employers and remote workers never have to pay fees, unlike most of the other platforms. The third is how effortless it is to interview and hire talent with their real-time communication tools built right in. For example, you can connect with candidates immediately using real-time private chat, browser to browser video & voice calling, video & voice messaging or just regular email. This makes hiring fast and easy. Lastly, once you hire on Outsourcely you can also manage your remote team via their built-in Team Workplace platform. You can even invite your existing team to Outsourcely and manage everyone under one roof. What it is: Upwork is the byproduct of the merger of two of the largest online marketplaces, Elance and Odesk. Combined, they created the undisputed market leader in the industry. How it works: We’ve written extensively here on the Biz 3.0 blog about how to hire people on Upwork. First, you’ll describe your project to Upwork and create project specs. This will reveal top profiles and proposals and allow you to quickly hire your favorite freelancer. Kick off your project in hours, not weeks. Scale fast with specialists, collaborating in your own shared online workspace. Invoicing, payment and tax forms are handled on Upwork. With Upwork Payment Protection, only pay for work properly invoiced. Why it’s different: The primary difference between Upwork and its competitors is its massive scale. No matter what kind of project you’re looking to complete, you will have hundreds of qualified experts to choose from. What it is: Freelancer.com is a global outsourcing marketplace very similar in function to Upwork, which allows potential employers to post jobs that freelancers can then bid to complete. Here’s how it works: You post a job and freelancers make bids to complete. You can then compare and select bidders. You pay once you’re satisfied with the work. Why It’s Different: Depending on your membership type, you will be charged fees once a freelancer accepts your offer. On Free, Basic and Plus memberships, you pay $3 USD, or 3% of the total project cost, whichever is greater. Standard and Premium memberships don’t pay any project fees, however, they have monthly fees of $49 and $199 respectively. What it is: Need a new website design? How about a new logo, brand, T-shirt, or even a car wrap design? Then perhaps 99designs can help. 99designs pioneered the marketplace where vendors compete for your cash in the form of a contest. You create a design brief stating what you need. Then you launch a contest to the marketplace. You’ll receive dozens of images, give feedback, and ultimately pick a winner. Why It’s Different: A 99designs contest effectively allows you to work with dozens of designers before choosing which you like the best. Instead of hiring a designer to create a logo and hope that they deliver a great final project, 99designs eliminates that guess work. You get to see a wide array of completed designs and pick the one that you like the best. Who it’s for: 99designs is perfect for the one off project that you need completed to move your business, brand, or website forward. With affordable pricing starting at $299, you get to launch a contest and receive approximately 30 designs. What it is: DesignCrowd is an online marketplace providing logo, website, print and graphic design services by providing access to freelance graphic designers and design studios around the world. DesignCrowd gives business owners access to a ‘virtual team’ of 467,374 so they can crowdsource designs from some of the best designers from around the world, at a low cost. On average, each design posted by a business owner can expect to see over 50 designs. Why it’s different: DesignCrowd is a lot like 99designs in that it is a crowdsourcing platform. You submit a project, wait for designs to come in, and then you pick a winner. However, unlike 99Designs, DesignCrowd gives you the opportunity to guarantee that you’re going to pay a winner. This might not sound like an advantage to the business owner. Why would you want to guarantee that you’re going to pay? 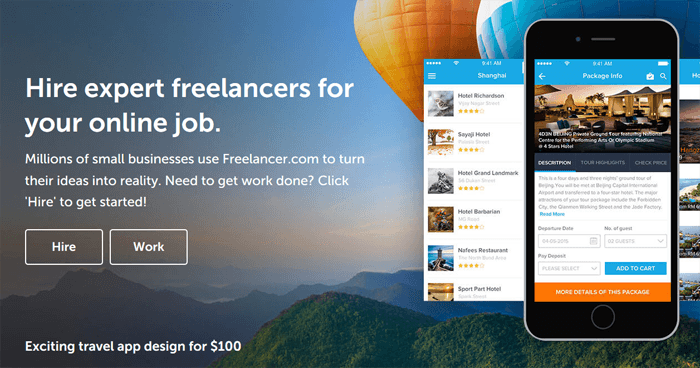 The positive consequence to this feature is that business owners who have used both 99Designs and DesignCrowd say that because the freelancer knows they won’t be working in gratis, they are much more receptive to your design changes. Who it’s for: DesignCrowd is perfect for the one off project that you need completed to move your business, brand, or website forward. The pricing on DesignCrowd is entirely up to the business owner. What it is: If you need to hire someone local, then TaskRabbit is the platform for you. TaskRabbit allows you to hire people to do a variety of skilled and unskilled labor for your business. While initially started as a consumer marketplace, TaskRabbit has several useful applications for business. If you need a personal assistant who is local, or a handyman, work on an assembly line, or even someone to be a bartender at the company picnic, TaskRabbit can help. Why it’s different: Unlike the other platforms, TaskRabbit is entirely local and designed for people who need to hire an extra set of hands. Who it’s for: TaskRabbit was initially built for the consumer marketplace, and still markets itself extensively as a business to consumer platform. However, small business owners who need additional help that only a local person can do can also take advantage of the service. What it is: Is a crowd-sourcing marketplace owned by Amazon.com that allows you to hire people to perform tasks that computers are currently unable to do. Amazon calls the businesses and entities who post “Human Intelligence Tasks” as requesters. These tasks include things like writing product descriptions or finding the phone numbers of tech companies. Workers in the marketplace can browse and complete those tasks within their qualifications in return for monetary payment set by the Requester. 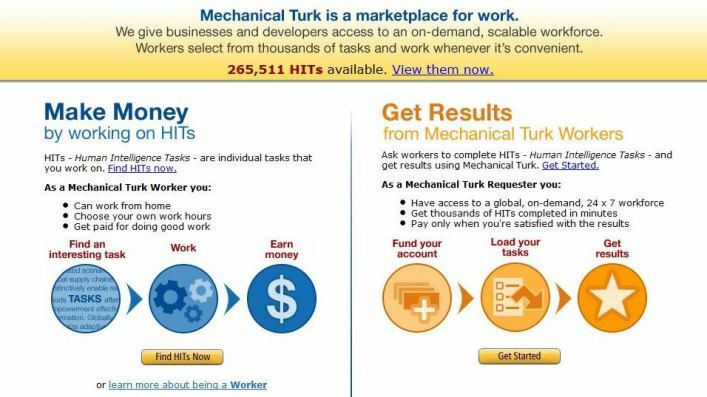 Why It’s Different: Mechanical Turk offers a turnkey solution to get your work done. You load the task that you want completed and get results from a crowdsourced marketplace. There is little to no interaction with the person (or people) who complete your tasks. You simply pay when you get the results and system will disburse your funds accordingly. Who it’s for: Mechanical Turk is perfect for businesses that need jobs completed on an as needed basis. Much of the work that is performed by the workers do not require a lot of task specific training. Therefore, workers can be assigned a task and work can be completed rather quickly. Let’s be blunt here. Mechanical Turk is the marketplace when you need to hire someone to do the grunt work. What it is: With PeopleperHour.com, you have three options to get started: Browse Hourlies™, fixed price offers ready to start immediately, post a job and let people find you, or search profiles and contact freelancers directly. Like other marketplaces, PeoplePerHour lets you choose freelancers based on reputation. You can read reviews of past work and hire someone who fits within your budget. Hourlies, which is PeoplePerHour’s trademark discovery technique allows you to find a service at a fixed price so you don’t have to negotiate or be surprised by the final cost. Features: Like Guru, PeoplePerHour.com gives you the ability to manage the project, share documents, and pay for the service without ever leaving the platform. PeoplePerHour also offers a satisfaction guarantee, and you only have to pay for work if you’re satisfied with the final product. Who it’s for: PeoplePerHour is ideal for small and mid-sized business owners who need a one off project like a website, app, or even a blog post. You have the ability to “shop” for a freelancer based on price, experience, and reputation. Some of the freelancers will outprice small businesses, but there can be some real bargains if you search hard enough. The marketplaces in the online outsourcing industry have experienced rapid growth and have been instrumental in scaling startups in the past ten years. Even just by looking at the outsourcing trends in 2019, we are already seeing its huge impact. We fully anticipate that in the future, these marketplaces will continue to grow and become even more ubiquitous and widely adopted. They will continue to permeate all corners of the business world. Thank you for sharing so much value..